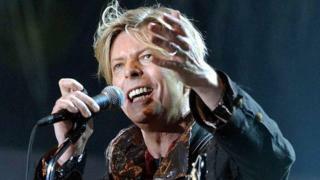 It's two years since David Bowie died and to mark the anniversary BBC World Service radio has commissioned a play about the making of his final album Blackstar. The actor Jon Culshaw has moved beyond the comedy impressions he specialises in to create a portrait of the artist in his final weeks in the place he loved so much - a recording studio. It may seem surprising, but until David Morley wrote his play The Final Take: Bowie in the Studio no one seems to have portrayed Bowie at length in a drama. There had been countless brief impersonations in adverts and comedy sketches on radio and TV. Some of those were by Culshaw, of Dead Ringers fame, who's now taking the central role in The Final Take. It's a semi-monologue, the other main role being Bowie's friend and producer Tony Visconti (played by American actor Martin T Sherman). "But of course doing a quick 45-second gag is totally different from a considered play about David's last weeks," says Culshaw. "And I'm happy to acknowledge the great Bowie impersonator for comic effect has always been Phil Cornwell who used to do him so brilliantly on Steve Wright in the Afternoon on Radio 2. But this play isn't about getting laughs." The Final Take was recorded late last year in a studio in London, with Dirk Maggs directing. Culshaw says it took a while to find the right performance. "I play David when he's in The Magic Shop recording studio in New York, so at first we tried to tape everything with the lights low for a laid-back, jazz club feel and me sitting down. But it didn't work: it sounded stilted. I needed to stand up and move around a bit even if the listener won't really get that. "The play is half what's going on in David's head and half his conversation with Tony Visconti. They were long-standing colleagues and real friends so Tony is deeply worried when David tells him he has cancer. Overall about 80% of what's in the script comes from what David wrote or said in interviews." Culshaw researched the role by going through those interviews. They were "invigorating," he says. "He has such a fantastic personality. However sad it was, I enjoyed studying what he said and figuring out how his brain worked. He was a wonderfully generous interviewee," explains Culshaw. And, above all, he says the accent he adopted had to be just right. "David had started with a South London accent but it was definitely from out in the suburbs - and of course he'd spent much of the second half of his life in the States. A comic take on Bowie's voice could be wildly exaggerated but if anything we underplayed." But also vital was respect, for both the music legend - and his family. Image caption David Bowie: Gave Jon Culshaw a rule "to live and create by"
"At one point in the script I was going to do a little acappella singing of a bit of Lazarus from the Blackstar album. But that was the one thing the Bowie estate asked us not to do," says Culshaw. "We show that David knows he has cancer but is resolute that it won't dim his energy or destroy his creativity. It's the core of the play and I think we all found it haunting. Even at the end he's at the top of his game." Culshaw says everyone involved thought of David Morley's play as a tribute to Bowie. "I'm delighted to be giving a performance that's not broadly comic but I was a little nervous at first about catching David's humanity," he adds. But, Culshaw concludes, one interview in particular "gave me courage". "David said if you're feeling totally comfortable in the work you're doing then maybe you're not doing the right thing. He said always go a little bit further into the water than you feel you should. It was the rule he lived and created by - so I tried to do the same thing." The Final Take: Bowie in the Studio is on BBC World Service radio on 30 January 1130-1200 GMT and is available on BBC iPlayer Radio.